Each year, pasty-makers take part in a unique event to find the pasty champions of the world. Professionals, amateurs, the young and the not so young come together in a day of music and fun where Cornwall’s hero product is the unquestionable hero of the day. 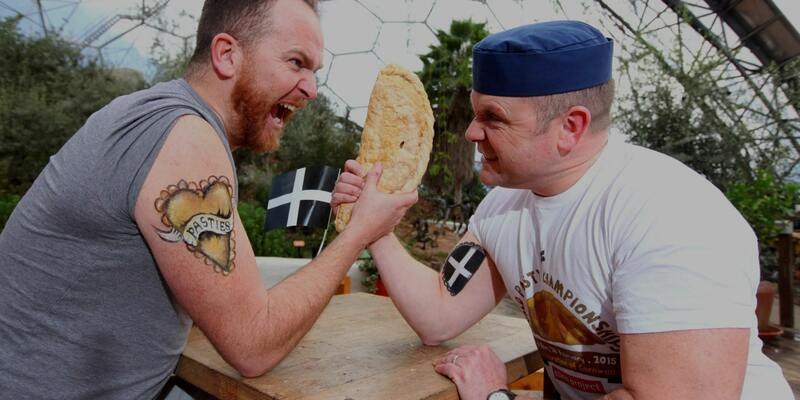 Created by and hosted at the Eden Project, the World Pasty Championships take place on the Saturday closest to St Piran’s Day and make a fitting grand finale to our own Cornish Pasty Week. The titles are fiercely battled and each year brings a few surprises. To compete in the Cornish pasty categories, all pasties have to be made in accordance with the PGI specification, including being made in Cornwall of course. However, each category also has an ‘open’ equivalent, where anything goes – and every year anything generally does go. Past championships have included all sorts of weird and wonderful creations, including road kill and insects! The CPA works with the Eden Project to make sure the day runs smoothly and is proud to sponsor the event. You will find our members there every year, helping queues of youngsters learn how to make and crimp a genuine Cornish pasty. The next World Pasty Championships take place on Saturday 2nd March 2019. The categories are split into two sections: Cornish pasties (made in Cornwall following a traditional recipe) and open savoury categories for pasties with creative fillings or pasties from outside Cornwall. Company: For pasties from companies (bakeries, butchers, pubs, corner shops etc) that have undergone a PGI audit. These must be standard production pasties that are sold by the company entering. Professional: Those who work in the catering industry as a professional baker or cook, who are entering their own pasties under their own name. This must not be a commercial pasty that is on sale anywhere. Amateur: People aged 16 and over on the date of the competition (2 March 2019) who do not work in the catering industry as a professional baker or cook. Junior: People aged 15 and under on the date of the competition (2 March 2019). The annual celebration is always a showcase for home-grown musical and comedy talent and culminates in the much-anticipated Oggy Oscars ceremony. There’s comedy, music, plus plenty of pasty fun.